Why is temperature an important consideration in thermoforming material selection? If you’ve ever microwaved last night’s leftovers in the typical plastic to go container, you’ve witnessed the effect that high heat can have on thermoplastic. The plastic begins to soften and lose its stiffness as the material temperature increases and if you heat it long enough or exceed the limit of its operational temperature range, it will begin to distort. Worst case scenario, when you open the microwave door to enjoy your meal, you are presented with something that can be quite unrecognizable from what you put in. While this example may not be relevant in all cases, it does demonstrate the importance of selecting a plastic thermoforming material with the appropriate temperature properties for your application’s operating environment. Imagine a similar scenario on an essential safety, structural, or functional component for a medical, transportation, or industrial application. Loss of stiffness (flexural modulus) and material distortion (heat deflection) are just a few of the factors to account for when addressing the temperature requirements of a project. 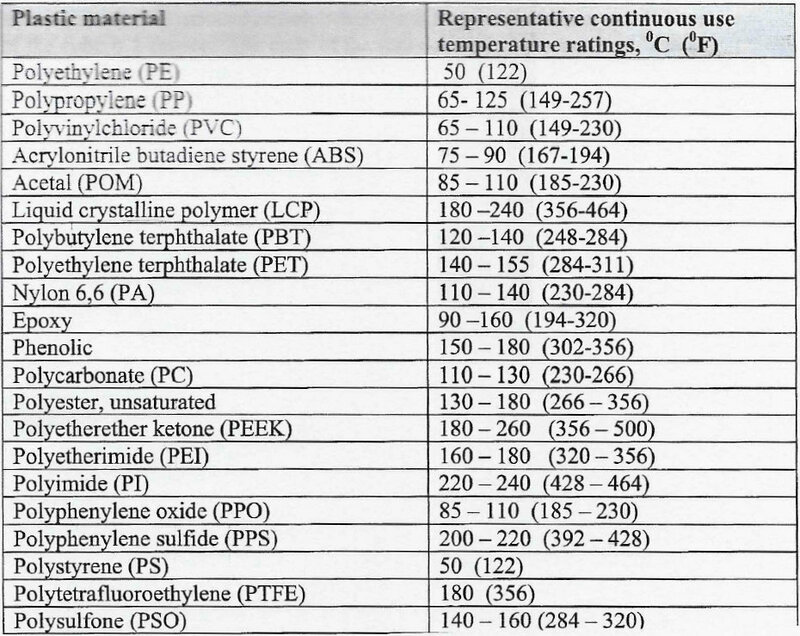 Most of the effects of temperature to thermoplastic occur at high heat levels, although excessively low temperatures can have an impact as well. Mechanical properties, chemical resistance, electrical conductivity, material fatigue, and many other attributes can be affected by increased temperatures. Below is a list of the most common considerations. Exceeding a material’s approximate heat deflection temperature can cause the material to distort. Prolonged exposure to heat while subjected to a load or force can also cause plastic to deform or “creep” over time. HDT is a good comparative specification of how different materials respond to the HDT test conditions but provides little information regarding the long term effects of continuous high temperature exposure on their physical, mechanical, thermal, and electrical properties. As temperature increases, material stiffness (flexural modulus) will decrease. As with most materials, plastic expands as temperature increases (coefficient of thermal expansion – CTE). This can be a consideration when the plastic is mated with another material, such as metal, that may have conflicting thermal expansion rates. If the dimensional change is obstructed, stresses can be induced in the plastic part due to excessive tensile, shear, or compressive stress loads that could result in unexpected failure. Thermal Degradation – Plastic materials subjected to prolonged exposure to high temperatures will lose strength and toughness, becoming more prone to cracking, chipping, and breaking, at a rate in proportion to the temperature and time of exposure. Materials exposed to higher heat for longer duration will wear substantially faster than those exposed to more moderate temperatures and exposure times. The quantity of heat that passes through a cube of the material in a certain period of time when the difference in temperature between the two surfaces becomes one degree. Plastic materials generally have a much lower Thermal Conductivity than metals. This makes them excellent replacement materials when thermal insulation is important. What environmental temperature range (high and low) will the part be exposed to operationally? What dimensional and stiffness (flexural modulus) tolerances are required of the part at the high, mid, and low points of its expected temperature range? What loads or forces are expected on the part at the high end of its temperature range? What is the time/temperature relationship? A low temperature for a long time can result in comparable properties damage as a high temperature for a short time. What is the projected service life of the application? Will the plastic part be mated to any other material types, such as metal, as part of the application design? What are the specified (FST) flame, smoke & toxicity requirements? As discussed in previous posts on material selection, when it comes to plastic material options, there are many choices and each has different thermal and mechanical performance properties. 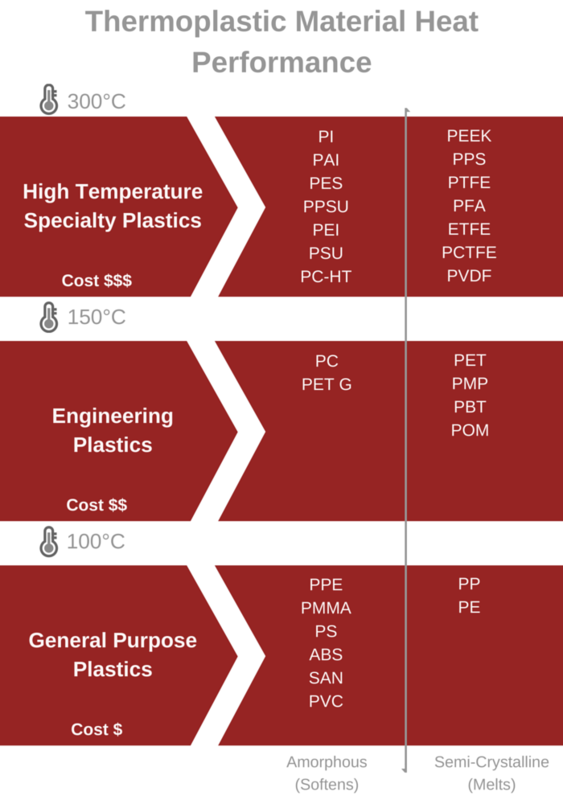 The information below will give you a general understanding of the operating thermal ranges of the common plastic material options available. Note: The options listed are generic plastic material formulations. Many plastic material companies have specific plastic material products formulated and designed to meet the demands of a wide range of industry requirements. For information on the thermal performance of these products, visit our material supplier datasheet page or our thermofoming materials page. Click here for a full list of plastic abbreviations and acronyms.